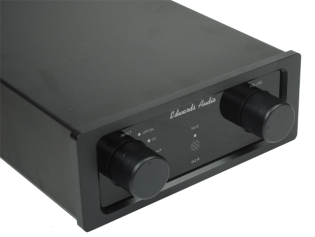 Edwards Audio IA1 MkII integrated amplifier is the latest version of the IA1 and features an improved power supply based on a 200VA custom wound transformer and DC blocking on its AC input. It has a backlit GREEN LED Acrylic front panel display with a 9mm thick custom machined frame with 40mm dia turned aluminium control knobs which are finished with a black anodised bead blasted finish. The main design is a spin-off from its bigger brothers, with some lessons learned along the way. It is based on an all-new class AB, Bi-polar, Darlington configured output stage using Sanken devices, coupled with a differential front end and buffered voltage stage. The main PSU consists of a custom wound toroidal transformer with 20,000uF of smoothing. The active pre-amp section uses a Soundwell volume control and features relay input switching. So, there are no compromises on the parts! The elegant ‘half width’ case size with LED backlit display allows the amplifier not to be imposing in aesthetics even with its flexible input arrangement: you have a line level on 3.5mm stereo jack and 4 line level inputs on RCA, one of which is labelled 'Option', for use with the optional moving magnet RIAA input stage. The PCB’s are all surface mounted using Vishay mini melf 1% resistors – not the usual thin film type which sound inferior. The capacitors, no less than Panasonic FM series and larger components are all hand placed and hand soldered as flow soldering has a negative impact on sound quality. The new power supply is designed around a 200VA custom wound transformer and its DC blocking can be found on its AC input. Upgrades like this truly enhance this integrated amplifier. The musical performance of this model truly belies its entry-level price tag. The model enjoys a green back lit LED acrylic front panel display complemented with a 9mm thick custom machined frame. A 40mm dia turned aluminium control knob is given a finishing touch with black anodised beads.